What Will the Future Sound Like? Silence. Does anything strike you odd about the description? 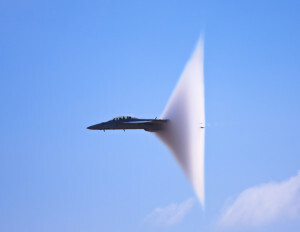 With a little reflection, it is obvious that a rocket traveling at four times the speed of sound wouldn’t “scream.” Rather, it would reach its destination in silence. The sound–a sonic boom–would only arrive later after the explosion itself. In many ways, this is what the future will sound like. It’ll arrive without sound. The reason can be found in this older post in which I used the example of a doubling lilly pad to describe the unexpected power of exponential growth. appears small—1, 2, 4, etc. Only later does the exponential trend pick up real steam. By the time most people wake up to the accelerating trend, however, it is too late. The trend has already arrived. So, if you think you’ll hear the future coming, think again. It may arrive suddenly and without sound. By the time “BOOM!” arrives, it is too late. The solution, of course, is to scan the horizon for distant trends that are today small but are accelerating.